There was an interesting article in the UK Guardian today (August 6, 2014) – Debt and housing costs make young worse off than past generations – which reported on the so-called ‘intergenerational fairness index’ published by the – Intergenerational Foundation, which is a UK-based organisation which “researches fairness between generations” and believes that “government policy must be fair to all”. 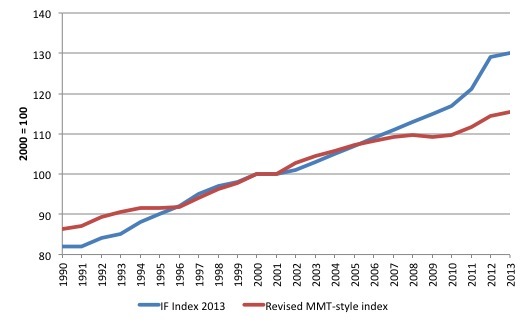 The – 2013 Edition – is the most most recent published version of the index. The UK Guardian journalist has the most recent index, which has not yet been publicly released (probably in London later today). The points I wish to make are not dependent on knowing the detail of the 2014 result. My concern is about principles and basic neo-liberal macroeconomic myths that are embedded in an otherwise reasonable exercise. A case of progressives shooting themselves in the foot again! The Intergenerational Foundation (IF) has an advisory board. It includes Paul Gregg, a professor of economics at the University of Bath and a co-author with Richard Layard on their alleged new idea of a job guarantee, which I considered in this blog – Employment guarantees in vogue – well not really. Essentially, the proposal is austerity-constrained and is nothing like the Job Guarantee, promoted by Modern Monetary Theory (MMT). Debt and housing costs make young worse off than past generations. Index comparing affluence over time finds under-30s have to work much harder to earn less today than their parents. Which debt might that be? Public debt scaled by each person in the UK. Implications for future generations – relatively meaningless. The intergenerational fairness index, which was created by a charity, the Intergenerational Foundation (IF), to compare the burden faced by younger people with that of older workers and retirees, rose to 133 points in 2014 from 130 last year. The 2013 Edition of the index outlines the methodology used. The index is motivated by the fact that “Today’s policy decisions affect younger and future generations”. Definitely! It also wants to go beyond a focus on “inequality between rich and poor” because those sort of measures ignore the “inequalities between generations”. The IFS thus “highlights the increasing problem of poorer young people financing richer older people”. A rising index suggests that younger generations may be less inclined to support a system that puts the interests of older generations ahead of their own. They collected measures back to 1990 for most of these indicators (two only from 2000) and they scale monetary aggregates by the GDP deflator (to measure everything in real terms) and all resulting numbers are expressed as per capita (thus scaling for population growth). The extent to which young people who are alive today are at a disadvantage compared to the rest of society. The degree to which future generations (those who are not yet born) will be impacted by the ways in which we live our lives today or by government actions (i.e. how much they may be advantaged or disadvantaged by the actions of those alive today). The so-called 9 content areas are where it gets problematic. 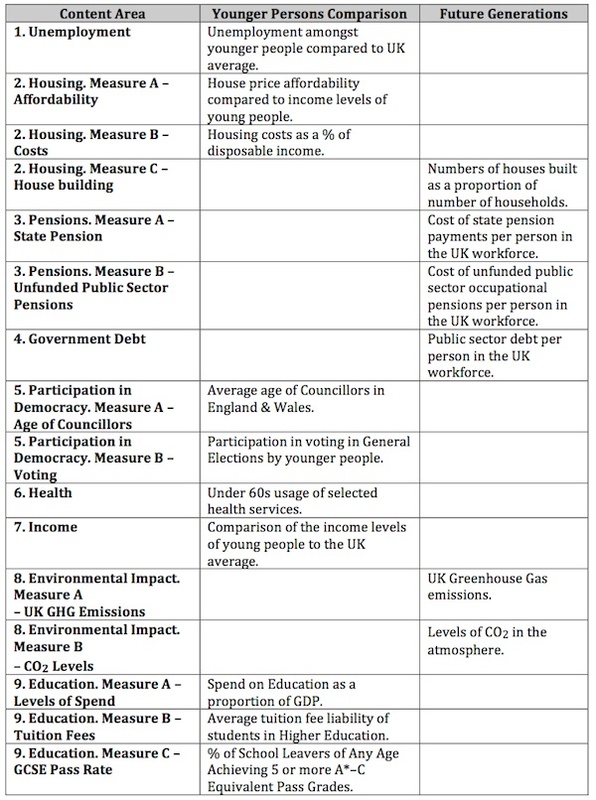 The following Table is drawn from the 2013 Edition and lists the 9 content areas with the ways they are measured and an allocation (columns 2 and 3) of whether the IFS thinks they impact on the first area above or the second. This is where there are huge shortcomings in the framework. First, unemployment has a huge impact on the current generation of young people. But it also has massive intergenerational impacts because we know from research that a child that grows up in a jobless household inherits the disadvantage of their parents. The current unemployed youth are likely to take deficient skills development and work experience into their adult lives, which makes them highly likely to be in insecure jobs later in life and be prone to unemployment. Second, housing affordability certainly impacts on the capacity of a young person to enter the real estate market, which for most of us is the only significant source of wealth we will accumulate over the course of our lifetimes (particularly in the Anglo countries). In that context, being deprived of that source of wealth will pass on disadvantage to the next generation and beyond. Third, Pensions and Government Debt – I will come back to. Fourth, Participation in Democracy – I do not weight that as highly as the other measures. Fifth, Income is a flow and impacts immediately. But it can also be stored as a stock (saving) and enhance future consumption and the wealth of families once the young person reaches adulthood. Sixth, Education participation and attainment, similarly impacts future generations because poorly educated adults tend to have under peforming children. The index is then computed by treating all the content areas as being of equal weight. Where there are two or more components to the content area (for example, education), a simple average is performed to create a composite for the content area. The raw data is then indexed (2000=100) to produce 9 time series of data from 1990 to 2014 (latest data unpublished). The Index numbers for each content area are then averaged (simple unweighted) to produce the overall IFS. … represents an increase in intergenerational unfairness. 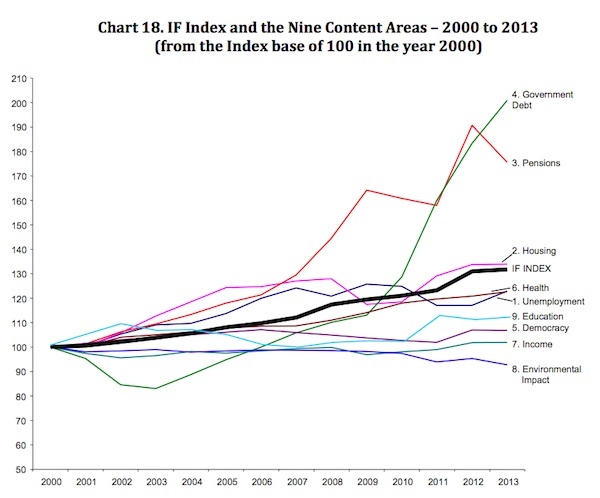 The following graph is taken from the 2013 Edition (Chart 18) and shows the individual index numbers for the 9 content areas and the overall average of them – the IFS (black line). What do you see? A huge rise in the unfunded public pensions (red line) and government debt per person (green line). In fact, the overwhelming driver of this index since around 2008 have been these two ‘content areas’. Young people face a steeper climb to achieve the lifestyle of today’s baby boomer generation, according to an index measuring intergenerational fairness which recorded a rise from last year. The declining affordability of housing for the under-30s accounted for the increase alongside a rise in government debt, which future generations must pay. I will reflect on this later. The co-founder of the IF claims that “”Like overloaded packhorses, our young people are becoming increasingly burdened by other generations’ debts …” (and other things) – but here the reference is to public debt. When government debt and public-sector pension liabilities are combined, the resulting debt per member of the workforce is now over £70,000, equivalent to more than three times median household incomes. Which is as stupid as saying that for every worker there are x square metres of publicly owned land. That assessment and the inclusion of public debt and unfunded pension liabilities for government workers in the index are based on a misunderstanding of what actually will burden the future generation. The fact is that the current government has as much ‘money’ now as it had yesterday and the same amount it will have tomorrow. That is, it has whatever it wants to spend. It always has that. It has no more or less capacity to spend today because there were surpluses in the past than it would have if there had have been deficits in the past. The implication of the IF Index components is that fiscal surpluses provide more spending capacity in the future or lower tax rates. That is plain false. Every generation chooses its own tax rates. That is, the mix of public and private sector involvement in the economy is a political choice. If the future generations want more private and less public they will choose lower tax rates etc. Currency-issuing governments do not draw down on the savings provided by the previous government’s surpluses. It is a nonsensical notion thinking that a sovereign government would ‘save’ in its own currency. It also belies the nature of government spending and taxation. They are flows – like a river – you don’t ask how much water has accumulated as it gushes out the tap. It is gone before you know it. Various metres can record the flow but unless there is a dam to store it as a stock it flows away. Same with spending and taxation – it is accounted for but once it exits the economy – as a surplus (spending less than taxation) then it is gone for good. There is no storage shed anywhere else where the surpluses are saved up and available for the government to drive a truck down and pick up some dollars to spend. Surpluses destroy net financial assets (money) that were previously in the hands of the non-government sector and these assets are gone forever. But surely, you will say, there is a dam – the debt and the big stock of unfunded superannuation (pension) liabilities. Yes, these are public liabilities but then governments can always meet their liabilities without recourse to income. While they don’t express it that way, that is what history tells us. The idea that borrowing ‘takes money from the pockets of future taxpayers’ is nonsensical. The funds to pay for the bonds originate in the government net spending in the first place. The deficits add to bank reserves and non-government entities decide that it is in their best interests to hold the net increment in wealth in the form of government bonds rather than reserves (manifested in bank deposits). So the government is really borrowing their own spending back! Clearly, deficits now are in part helping the current generation with income transfers and the like. But they also facilitate public education, public health and other infrastructure which provide massive benefits into the future for the current generation and their children. Once you understand that then the idea that there is a future burden will make you laugh. Further, the interest payments are incomes to the bond holders who presumably enjoy the return on their saving. Most will have children who will benefit from those payments. I have never been asked to pay back the public debt that was accumulated as non-government wealth by my parent’s generation. But I sure benefited from the public infrastructure that the continuous fiscal deficits allowed the government to provide. If you want to provide for the future generation then the things that will matter are education, employment and public infrastructure. All three are investments in the future. On all three, the previous government failed dramatically. The best thing this government can do to prevent entrenched disadvantaged among our youth is to ensure they have work now or are in education and training programs. Enough work to go around at reasonable working conditions and sensible pay is the best way forward. I considered these issues in this blog – The rising future burden on our kids. The UK Guardian article stooped to quoting Laurence Kotlikoff from Boston as if he is an authority on the topic. Please read my blogs – Several universities to avoid if you want to study economics and If only the citizens knew what was going on! – for more discussion on why he should never be quoted on intergeneration burdens. Kotlikoff is the character who gets Op Ed space telling everyone that the US government is bankrupt, despite the fact (which he knows) that it can never become bankrupt unless it chooses to default on its financial obligations for political reasons. I acquired the IFS database up until the 2013 Edition and did some reworking. First, I took the unfunded pensions and the government debt out of the calculation to get a revised index (equal weights for the remaining 7 content areas. The following graph shows what happens. The index rises but not by as much. 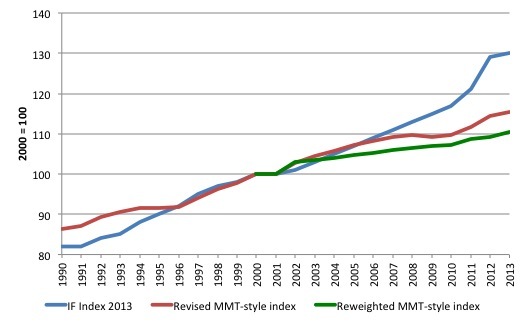 The main drivers in the evolution of the red line in the GFC and aftermath were deteriorating housing and health. I normalised the weights to sum to one. The next graph shows three series – the official IF Index, the equal-weighted index excluding the pensions and government debt (red) and the re-weighted series (green). My research centre is currently producing a new ‘Economic Prosperity Index’ at present so I have been looking into weighting schemes etc – just a bit of fun really. I could have manipulated the components that have been of less importance in recent years more highly and the index would be much flatter and vice versa. The idea of an intergenerational fairness index is excellent. Unfortunately, this specific application of the idea would support economic policy changes that would make the actual drivers of such unfairness deteriorate even further. By including irrelevant components like government debt per worker, the creators are inviting the government to say – okay, austerity time to get the debt down so the “packhorses” are less burdened. What they will have less off are jobs, good schools, universities, hospitals and the rest of the public infrastructure that public deficits provide. I note that Baron Layard’s wiki page ignores his period as adviser to Yegor Gaidar and Jeffery Sachs’ economic shock therapy which were marked by a complete indifference to the Russian population’s happiness over the pressing need to plunder the chaos. The fact that this malign,self indulgent and opportunist bureaucrat sits on the left in our deeply undemocratic second chamber reinforces the point made in yesterday’s post. Out of a Ducal Coronet Or, a Mullet of six-points radiated Or, pierced Gules. Quarterly: 1st & 4th, Gules, a Chevron between in chief two Mullets of six-points radiated Or, pierced Gules, and in base a Crescent Argent, on a Chief Azure, three Mullets of six-points Or, pierced Gules (Layard); 2nd, Gules, a Cross Or, in the dexter canton a Lion rampant supporting an Anchor erect with Cable Or (Croze, anciently Croissy); 3rd, Vert, three Doves volant Argent (Balaire). Speaking of intergenerational fairness, Larry Kotlikoff, America’s gift to the topic, was back in the NY Times with an op-ed just days back. Suppose that Peter lives on the right side of a river and Paul on the left side. The total flow is 2000 liter per minute. Each is entitled to half of the flow. There is a deal between the 2 that for 100 months Peter can use 1500 liters per minute, but 50 years from now, Peter’s heir has to allow Paul’s heir to use 1500 liters per minute for 100 months. We can then say that there is no overall burden on the heirs, but Peter’s heir is burdened while Paul’s heir has an advantage. Similarly, when a government finances expenditure through the sale of bonds to the public, then there is no burden imposed on posterity because posterity inherits both the debt and the assets (in a closed economy). However, if all those bonds are held by a small minority of taxpayers, can’t we then say that the majority of future taxpayers has been burdened by this operation? Unless you know what his advice was, you can’t make any valid conclusion. The rush to a balanced budget that’s often labelled “shock therapy” was the most sensible way of ending the hyperinflation that was crippling the Russian economy. There was plundering as well, in the form of selling off state enterprises for far less than they were worth, but AFAIK he wasn’t involved in that. The following year I was again in Moscow and met with Professor Richard Layard, of the London School of Economics, who was advising on economic reform. He told me that he and a colleague had boarded a Moscow bound plane in London with the idea that reform had to be carried out gradually and with care. However, by the time they had arrived in Moscow they had decided that it would be best to implement reform as quickly as possible, including the use of “shock therapy”. They thought there was a “less than 50 per cent chance of this working”, but that it was “worth a try”! I was stunned. It was Layard’s first trip to Russia, but flush with enthusiasm he was willing to disregard his ignorance and offer such “hawkish” advice on the basis that it was “worth a try”. So he was all for Shock Therapy and that did increase the happiness of a small group and decreased it for most of the population. Post 1992, GDP fell by 40%, hyperinflation wiped out peoples savings and a lot of real world assets were concentrated in very few hands. In 1992, the first year of economic reform, retail prices in Russia increased by 2,520%. I envy your certainty that shock therapy was the best way to deal with hyperinflation. Seemed to a great creator of it. James question is actually very interesting. The solution to raise taxes on income to control inflation and stifle demand seems unfair. If interest payments on public debt are just as inflationary.In a situation of inflation,it seems unfair that working people would have to have a tax rise, whilst interest payments on government debt would be continued to be paid out to the holders of public debt,when the debt expires and it has to be relinqueshed . Under those particular circumstances the government would be forced to undertake an income transfer from the working people to the wealthy. If interest payments on public debt are inflationary like tax cuts,should they not be shaved first if the government of the day was faced with inflationary pressures. okay fine, things like Health and Enviroment are important .But for me the issues are cheap quality housing and high incomes to afford a good work/life balance ( lots of time off and holidays) and low unemployment to support higher wages and income. When looking at housing affordability, I hope the IF were incorporaing the effects of social housing, not just home ownership costs or private rents. The benefits of housing are mosly that we have a base to work from and shelter etc. Social housing provides this as well o better than we can find from the housing market. The financial value of a house we own has no real impact on our quality of life or our potential output of goods and services. With regard to content area “3a” (State Pensions). The only way they can claim that this should increase the index value, is if they can know in advance what the level of state pension povision will be when those younger generations reach retirement age. They cannot know this for sure, so it is probably spurious. They are probably just assuming that state pensions will be less generous in real terms in the future. They include the “unfunded government pensions” as a drag on future generational welfare because they assume taxes have to be raised to “fund” the payments. A standard orthodox argument. Spurious nonetheless. The transition from communism to capitalism is something best carried out slowly and carefully. However, when the problem is a collapsing currency (hyperinflation) that should be dealt with as quickly as possible, firstly because the economy is essentially paralysed until it is dealt with, and secondly to prevent dollarization. When other countries are unwilling to directly intervene (which unfortunately was the case — had it not been, things would have turned out very differently) the way to cure hyperinflation is to balance the budget immediately. This is what gets labelled “shock therapy” but if you can think of a better solution I’d like to hear it, as nobody else has yet. Some economists have rightly been criticised for having a hammer as their only tool and seeing every problem as a nail, but under that metaphor this is the one problem that really is a nail! So unless you’re saying the reforms were the cause of the collapsing rouble, which seems unlikely considering it was the result of a huge trade imbalance due to the prolonged overvalued fixed exchange rate, the timing is a coincidence. However Bill has previously pointed out that the advisors did make one enormous mistake: after initially stabilizing the rouble, they refixed it at a lower rate, setting Russia up for a second round of hyperinflation. While I know it’s not your preferred way of looking at things, it’s far from nonsense, as there is an opportunity cost however the pensions are funded. What exactly is the opportunity cost of the central bank creating the pension payments ‘out of thin air’ and crediting the relevant bank accounts of the recipients? A bit of digital bandwidth congestion perhaps. The opportunity cost arises on the spending side when the recipients spend the pensions on good A, which requires real resources to be produced that might have been used elsewhere. That’s actually a very good question, desipite your ridiculous iniitial answer. Comparing the effects of funded and unfunded pensions, I believe the answer is that the yield rate for stocks and bonds would be higher for the same employment/inflation outcome. And that’s ultimately bad for business because it reduces their ability to make profitable investments. If there is a problem with a collapsing currency, then why not just impose currency controls? It worked for Malaysia during the Asian financial crisis. If your concerned about currency then don’t don’t make it convertible until you are ready. It took the UK about 40 years. The mistake was in making the rouble convertible. Applying a post hoc shock therapy based around advice from vivisectionists like layard obviously did not work, even though he was trumpeting its wisdom in his rather premature 1996 book; ‘the coming russian boom’. If you are wanting to use mechanical analogies, a better one would be the renovation of a building. You don’t start messing with load bearing structures without bracing them well and you shouldn’t ‘give it a try’ while people are still living in it. But that is all pretty much beside my point, that Layard put his long term interest in ‘happiness’, which most people would agree is dependent on the unfashionable concept of social security, aside when the wind and funding was blowing in a certain direction. The worldwide glut of people, like layard, all too ready to take ‘difficult’ decisions for others is the problem. There is also the generous tendency in people to ascribe incompetence where malice and veniality is actually present. Indeed, I consider the prominence given to his happy economics is all rather rich, telling people whose living standards are being crammed down that money doesn’t make you happy. One odd thing in mainstream reasoning is the surplus or balanced budget and that deficit is a future burden. If one believe so it should be logical that investments for the future not be a burden on the people living in the present budget year. Why should they pay in full now what citizens in the future will benefit from? That this seldom or never are stressed from the left just say they don’t care at all about economics. In September there are general election in Sweden. One of the Social-democrats main attack points is that the present right/wing gov have temporarily have abandoned the surplus goal. And they promise to restore this and have a surplus. The social/democrats attack the right for having a deficit of 1.4% 2013 as extremely irresponsibly. Social/democrats main theme is raised taxes to finance public spending. Witch is not honest then there are rules/regulation that sets a budget ceiling, even if you take in more taxes the rules/regulation sets the level of spending. TV debates are hilarious, someone wants to do this or that and immediately opponents or reporters bounce back the question, how have you finance/funded that? The one odd thing in mainstream reasoning is the surplus or balanced budget and that deficit is a future burden. If one believe so it should be logical that investments for the future not be a burden on the people living in the present budget year. Why should they pay in full now what citizens in the future will benefit from? and the graph shows a higher number of people under 40 with mortgages than ever before and the highest number of under 60s owing their homes outright than ever before. Of the 7 million under 25s, 2 million are university students in any given year so will be the bulk of “young renters”. The ons website says that 2 million single parents live without the second parent doubling the demand for housing capacity and increase welfare requirements funded by taxes that the rest of the population pay in to including pensioners. 41% of tax revenue are collected directly from income which includes NI. This means that the remaining taxes are collecting indirectly such as VAT which all older people pay in to as well as young, therefore the debt burden is shared. It would be interesting to compare the “fairness” charts – all versions mentioned in your blog with one created for the period 1950 -1990.